Unlike the past several weeks where I’ve done nothing but sculpt, this week I’ve been making oodles of Skinner Blends, rainbow blends, color recipes, research for upcoming projects and canes. It’s the “caning” time of year for me. I love canes & making flower petal canes is so much fun for me. Not only do I get to use the cane to sculpt, but I get to make myself a pretty new necklace too. I make a pendant from every cane as a little “memento” of my work. There’s always a lot going on in my studio. I haven’t been near as good about taking photos as I used to either. I’ll do better, I promise. You can always see my “behind the scenes” glimpses and work on Instagram as well so be sure to follow me there. I’d love to see what you’re working on too. Feel free to share with me what you’re working on in the comments below. Post a link to your WIP post or a photo. Here’s the first batch of “research” that I did for this week … going through Polyform’s newest color releases of their SculpeyIII, Premo!, & Premo! Accents lines of clay. To make my swatches, I make sure that each clay is fully conditioned so I get the best sample possible. Then I run the color through a #2 setting on my pasta machine, cut out 1/2″ round, and bake at 285 for 45 minutes, which is my minimum bake for most of my projects. You can see the full review of each color as well as their samples here. Here’s just one of the pendants I made from the cane that I made from last week’s dragon. This pendant was made from a blue/green Lily cane (yes I know it’s not a real flower). You can see the mini-tutorial here. SPOILER ALERT: Finally, I spent way too much time on this week’s dragon for the 2015PCChallenge. But I will admit that the end result (big reveal tomorrow) was well worth the effort. He’ll be available for adoption in my Etsy store soon. In case you missed it, the cake topper I made for a custom order was delivered last week and the adopter LOVED it. Check her out here. Melissa Terlizzi’s gorgeous new piece, “Until the Storm Passes” is a true work of art. As an added bonus, it is sure to make you go “awe!” Be sure to follow her on FaceBook. With Polyform’s new color releases, they have been issuing new tutorials almost daily on their website. Be sure to check them out and be inspired by a fun new project. Wondering what I’m working on? 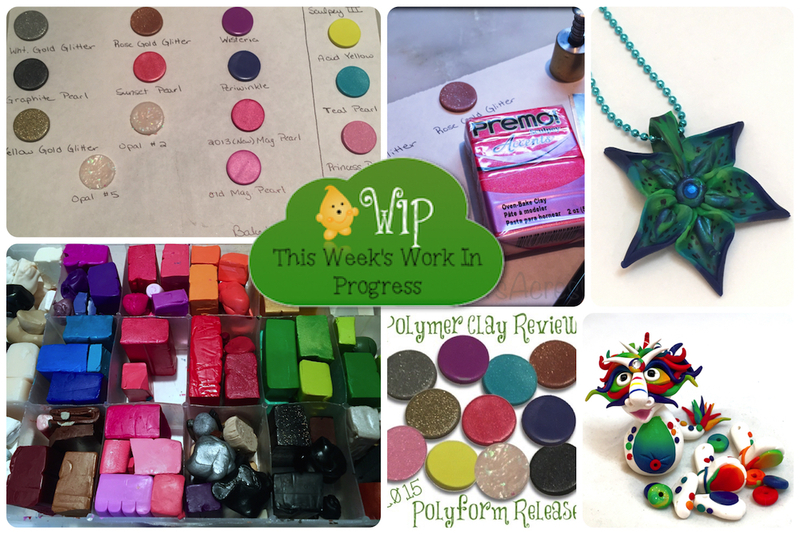 Be sure to follow me on Instagram to see WIP photos as they happen in my studio. I’m craving burritos! Not the ones you buy, but homemade ones. I’ve had one almost every single day for lunch this past week. I stuff them with rice, mozzarella, basil, tomatoes, & drizzle with balsamic vinegar. Yep … addicted to them. My puppy has decided that now that she’s almost 6 months old, she’s going to behave more. She really does too. I let her nap on the beanbag instead of her bed. She snuggles me at night. AND … I’m very proud to announce that we are officially HOUSE-BROKEN! Not ONE accident in 2 weeks. Go Mocha, go! Every day while I clay I wear an apron. Wearing an apron allows me to “fluff off” my brushes, wipe mica filled fingers on myself, and more. After all … sometimes it’s just too much work to go wash your hands all the time. Well, after a long day in the studio experimenting this past week, I looked down at my apron and “oh my!” I was a dirty, dirty, crafty mess! So … for the first time in a VERY long time, I washed my apron (good thing I actually have 3 down there).